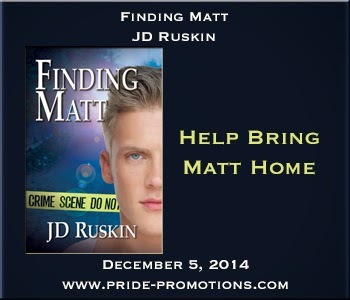 JD Ruskin writes character-driven romance stories about complex men from a variety of backgrounds. JD is greatly influenced by her time in the Midwest, from the bustling streets of Chicago to the cornfields of rural Illinois. She enjoys writing stories with juicy plots, memorable characters, and smoking hot encounters. 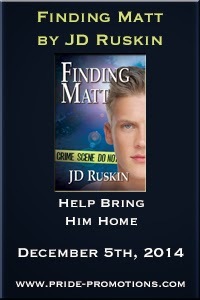 JD's first novel, When One Door Opens, was a finalist in the Rainbow Award and the winner of 2014 Epic E-book award. When not writing, she has a passion for traveling, photography, and graphic design. 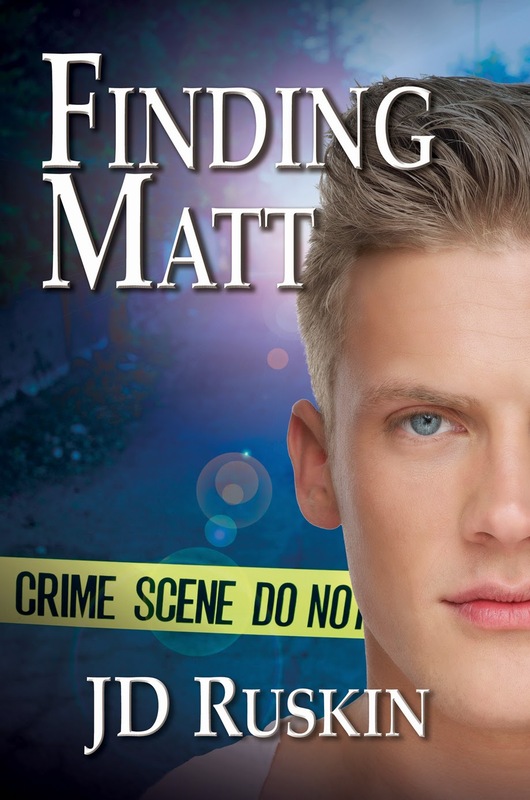 When six-year-old Matt Wilson and his Shih Tzu, Pixie, step out of the Stanton Community Hospital and disappear, his desperate parents convince Jaron Greenberg, a local pet psychic, to aid the police in the search. Jaron specializes in finding lost kitties and fixing problem pooches. He isn't prepared for a case with so much at stake. And as soon as he starts, the abilities he's had since childhood begin changing and growing in unexpected ways. 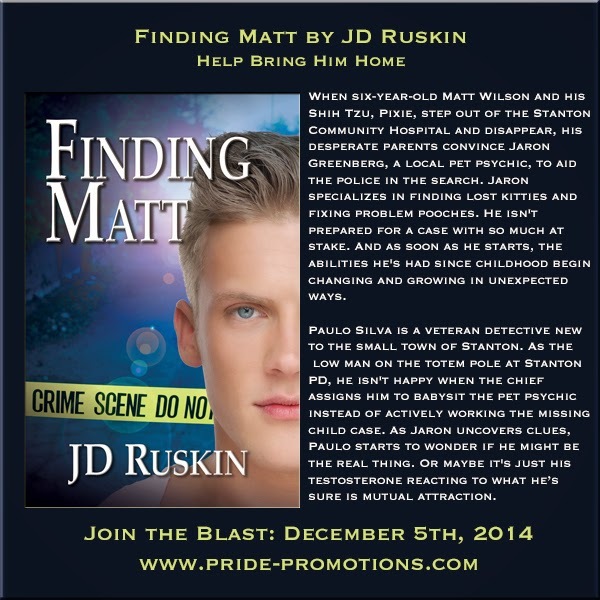 Paulo Silva is a veteran detective new to the small town of Stanton. As the low man on the totem pole at Stanton PD, he isn't happy when the chief assigns him to babysit the pet psychic instead of actively working the missing child case. As Jaron uncovers clues, Paulo starts to wonder if he might be the real thing. Or maybe it's just his testosterone reacting to what he’s sure is mutual attraction. THE HYSTERICAL yapping of a dog could be heard through the thin walls separating the small office from the main business area. It must be bath time for the Pomeranian. Resisting the urge to sigh, Jaron Greenberg gave his prospective client what he hoped was a reassuring smile. “I’m sorry about the noise. Most dogs love getting the full spa treatment at Pampered Pooches, but a few are nervous about getting their paws wet.” A chorus of barks joined the Pomeranian in doggy solidarity. The old woman’s eyes widened behind her thick glasses as Jaron’s Newfoundland poked his massive head up to see what the racket was all about. The dog’s thick black coat and calm demeanor meant more often than not he blended in as he sprawled half-underneath the desk on the black tiled floor. Mrs. Reynolds smiled politely but clutched her leather purse to her flower-covered bosom. It was hard to blame her. Bear really was a bear of a dog. A hundred and sixty pound teddy bear.